JavaOne is such a fantastic event! The next day of JavaOne 2014 will start in a few hours. It is an excellent time to find out about the new technology, plans, developments and releases for the near future. The first day of Java One 2014 was very busy as there was lots of interesting sessions to go to and learn about particular areas of java as well as finding out about the Java Strategy and Technical Keynotes that gives you the overview of what Oracle has been busy working on in the past year. So has been happen and what have they been talking about? 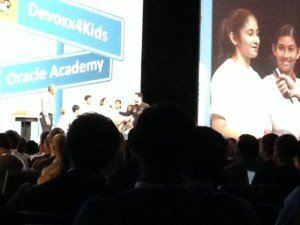 I was surprised to see how much Oracle cares about children and the importance of teaching them programming. Oracle focus on the Java community and their feedback is important and it is them as its the community is there to help them to improve java to make it even better. Every feedback is taken on board, so it is important to report every bug find. Java 8 was just released and there are already plans for Java 9 and Java EE8 . Amazing! Being at Java One keeps you on track with what is going on around. This year there are few sessions related to this topic and also the IoT (internet of things) was mentioned on the Java Strategy and Technical Keynotes. It is a hot topic this year and it is better not to be missed. This year there are many sessions focusing on JavaFX it has new features and advantages over Swing. It seems that many developers are moving towards JavaFX and now share there passion and enthusiasm for it. There is java library that allows you to create object in 3D and print it using a 3D printer. I love Java One as I am having an excellent time here. The spirit of Java and the passion of those excellent programmers who are here this year is just amazing. I never thought that people could love their job as much as I do but on the other hand why not, it is us who is changing the future for better. If you want more information on JavaOne 2014 and further coverage of the entire event check out our JavaOne Series Index, which covers everything that is happening and is constantly updated, keep checking back for new info!